I had to get up a little earlier for the 10K, because the start time was earlier. Hey, that makes sense, right? I walked to the bus stop at Art of Animation this time, as my friends were sleeping still (lazy bums) and not doing the 10K. It was a rather short line, and I was there about 4:15. Got on the first bus that arrived past when I took my place in line. Prior to getting in the bus line, I stopped for a quick picture with Prince Eric. Though, it was a badly aimed selfie, and I only got part of him. But you get the gist. I dressed as Ariel, in case you couldn’t tell. Well, I didn’t wear a seashell bralette and fins; just purple & green (and a starfish with some seaweed all up in my hair). This time upon arriving, I was there at about 4:40. So, considering the race didn’t start until 5:30, and I was in Corral E (ahem, the last one), I had a good amount of time to wait. 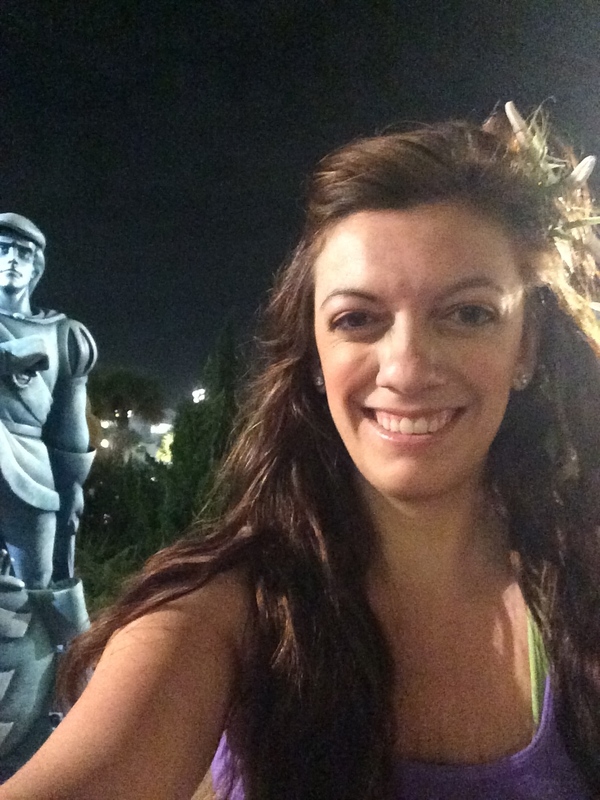 I have a friend that’s in Spain right now, so it was nice to be able to message while I was waiting (since who else would be up at 5 in the morning on a Saturday aside from us crazy Disney runners). In my Corral I found another spot to sit down. I did meet a couple of people to talk to while waiting to take off. We saw the A corral go by and cheered them on. It would be another 40 minutes before we started (about 8 minutes between corrals). Why Disney, did you put me in the last corral. Oh yea, I forgot to submit a time. Silly me. Though, I’m not sure my submitted time would have done me any better. Ha. Though, once we turned the corner to go toward the start line, it narrows. And let me tell you, princesses be pushy. 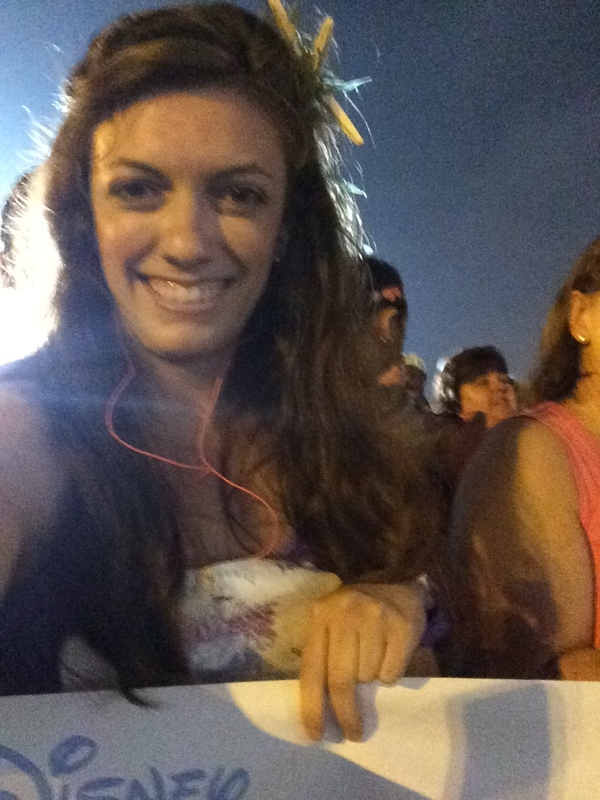 While I was holding on to the tape, I was quickly pushed back and out of the way. No more tape holding. Apparently, manners are out the window as soon as you start walking toward the start line. No matter, I was still near the front, and like at the 5K, was able to get a good start ahead of the corral. We started off in the lovely parking lot, and headed out onto a ramp. Elsa was hovering on an overpass, spreading cheer (and SNOW!) down upon runners. That was a nice little surprise at the beginning of the race. I didn’t think the Frozen sisters would appear at all. I mean, if they had showed up for a character stop, the race would have frozen still (hardy, har har), because everyone would want to stand in line for them. 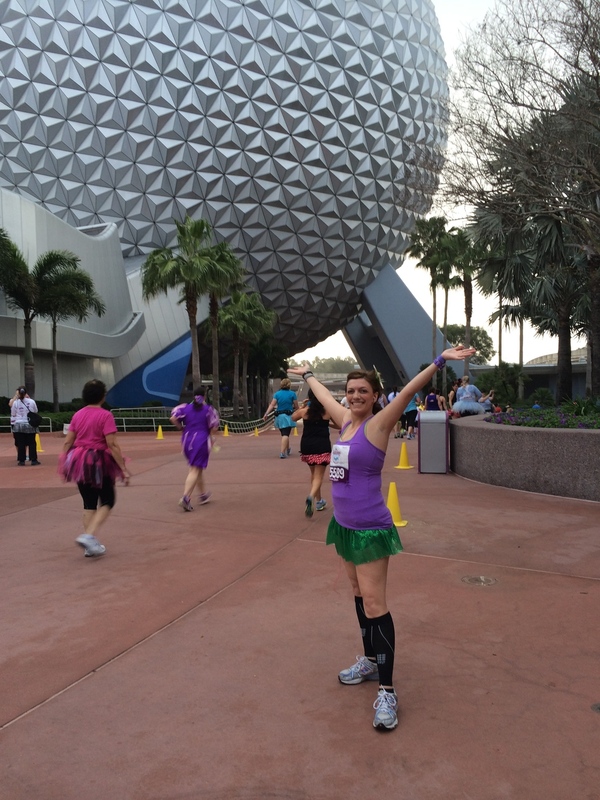 Going into the 10K, I wasn’t going to stop for a picture unless I saw Ariel. At least that’s what I told myself. 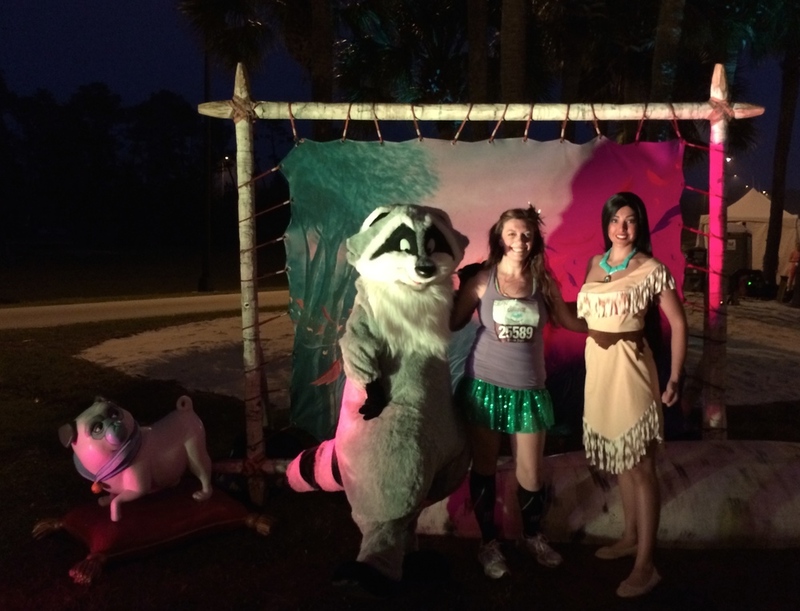 But, right around mile 1.5, Pocahontas and Meeko were out and only about 5 people were in line. I told myself “go ahead” and I did. It was only about a minute wait, so not too much time off my race. I’ve read the White Rabbit was out, but I didn’t see him. Before I knew it, we were past the half way mark and in Epcot’s World Showcase. This place looked familiar… I was just here yesterday. I picked up some much needed water in Japan and headed around the World. I saw Jiminy Cricket and just had to stop. 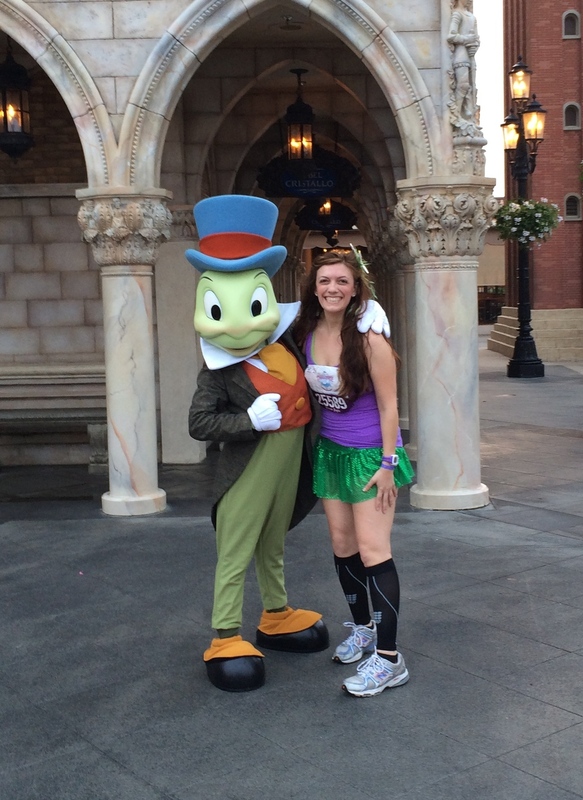 In all my years of going to and working at Disney, I had never took a picture with Jiminy. I was really happy with taking this picture, which I think you can see by the wide grin on my face. That made me motivated more for the remaining 3 miles. Tiana, Prince Naveen & Louis were in America, but I didn’t see them. I guess a bunch of characters had to go take their break (the White Rabbit always seems to be late for something, and Tiana probably had to freshen up) when I was going by. Bummer on that. So, on that note, I didn’t see too many characters out. But, I think I just missed them. And I wasn’t planning to stop, right? I did see Marie in France, and passed on her. She’s a pretty little kitten, but I was ready to finish and get going with my day at Magic Kingdom. 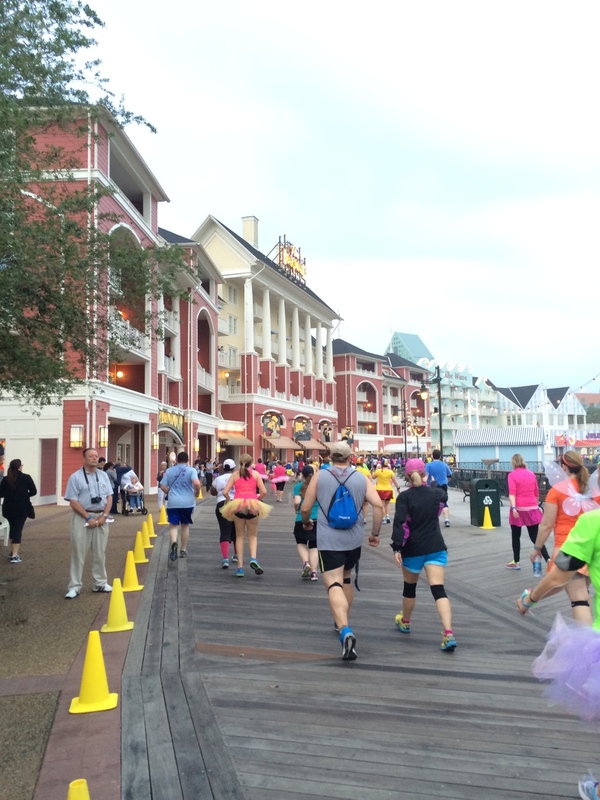 After leaving the World Showcase, we ran along the corridor to the Boardwalk Resorts and took a nice circle around the water. The Boardwalk was interesting in that a lot of guests were getting started with their day and just casually watching; while others were holding up signs and cheering us on. We were running on different types of wood and street, too, so different than the paved road we had been on earlier. Goofy in baseball regale was the only character I saw along the Boardwalk. I’m realizing now that even if I don’t stop for pictures with characters, I could always stop and take a picture of them…or other interesting items along the way. In fact, heading around the loop, towards the end, I saw the Chimney Sweeps (Patty of Margaritas, Miles & the Mouse & I believe Julie from the Disbroads) run quickly on the beach to take some pictures on the swing. Why didn't I think think of that? These recaps should be much more picture-laden. And I totally failed (especially with the Half Marathon). 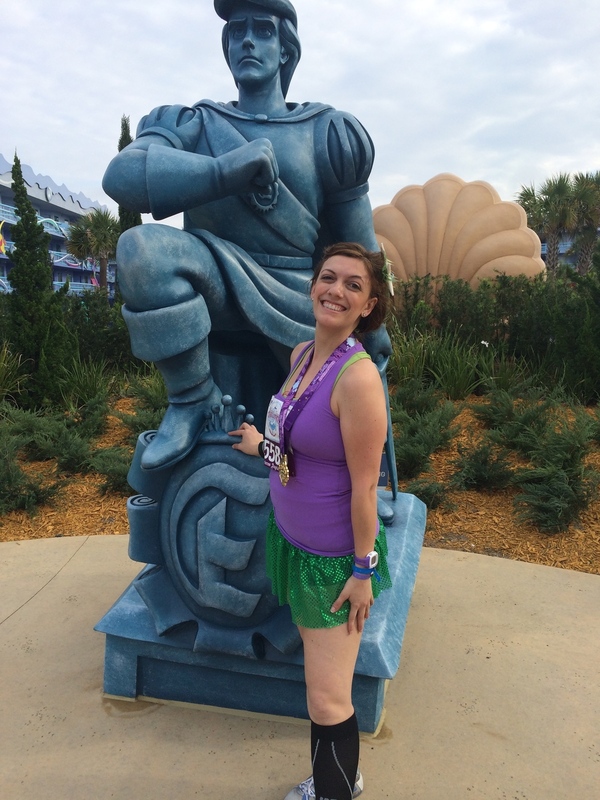 I’ll make a note of my favorite costumes that I saw at this race: Mulan and Mushu. A woman was dressed as Mulan in her training uniform, complete with plates around her wrists, and her companion all in red was Mushu. I loved these, and snapped a picture as they passed. Sorry complete strangers for oogling over your nicely done costumes. Making our way back into Epcot there were huge puppets of Lumiere and ....I forget the other one. And of course I don’t have a picture. I asked someone to take a picture of me in front of the Epcot ball. Of course, I had to. Again, friendly staff and people along the way are always so great in getting you pictures if you’re flying solo. I passed up getting a picture with the Duck himself, Donald, and continued on. I will say there is a point where you run near the building where the Character Stop is, and under a structure that the pavement changed and became quite slippery. I was walking at that point, but it wouldn’t have really been condusive to a fast run. And, before I knew it, I was at the end. It felt nice to put this medal around my neck. I happened to see that Belle was out in the reunion area, but asked a Character Greeter and heard that Ariel would be coming out shortly, they were trading spots every half hour. 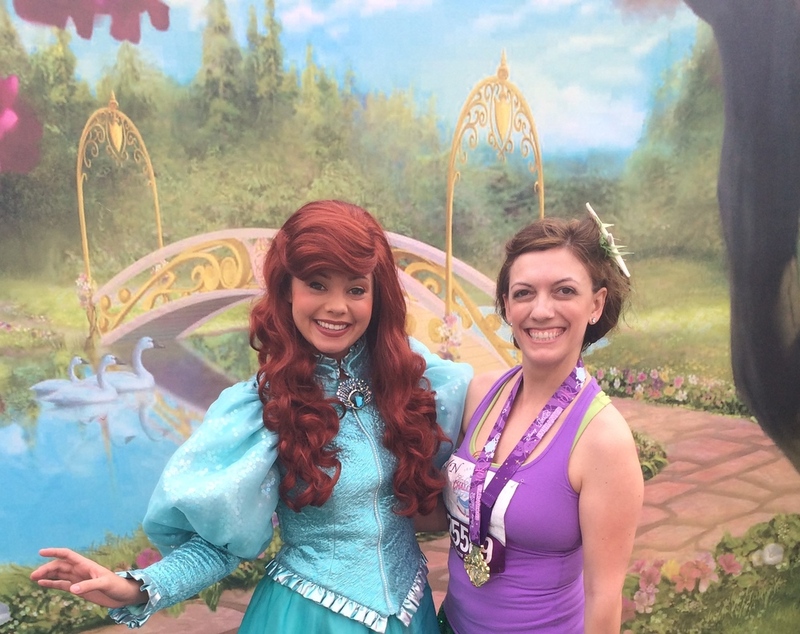 So, I waited in line (and actually let people go in front of me), so I could get a finisher’s picture with Ariel. Little did I know how much I’d be missing that Belle picture the next day, but I wasn’t dressed as Belle either. I waited with a few other “Ariels” too while in line. Back at my resort, I took another picture with Eric. So, a before and after. This time I asked a stranger to do it. I would have probably done the same in the morning, but nobody else was crazy to be out at 4am. We were actually at a decent hour, so normal people were going about their vacation. Back to my room to shower, and then it was time to head to the Magic Kingdom with my friends!